My first blog on the new site! Well this is exciting! Firstly I wanted to express my thanks for taking a look at my website and supporting the work I’m doing. I thought I’d start a Blog to give you an up to date insight into what I’m working on and the images I’m making. There’s plenty I don’t show the world on social media because I’m always worried they may be used by others, and lost in the ether of the Internet. So here we go. Comments and Questions are always welcome to! As many of you have seen on my website, I’ve been photographing the community and space of Bristol Wood Recycling Project on Cattle Market Road for the past 8 months. The project started after a visit for some wood for a personal project, though I soon went back to them with an idea of telling their story with a photographic documentation. They were pleased with my passion and welcomed my involvement and the exposure it may bring. Bristol Wood Recycling Project were given notice to vacate their home of 14 years in late August last year from the land owners, Bristol City Council. The Council, a huge supporter of the project had let the yard out to the project, as the land was otherwise derelict and unused. It was part of the disused Parcel Force building, which has stood abandoned for two decades. In 2017 development of the land was proposed and the future of the cooperative became uncertain. This uncertainty inspired me to make sure the organisation was recorded and their good work and community was documented along with the space and land as it is. The images I have made at the project are predominantly portraits, aiming to show the broad and diverse community involvement at the project. There is a very prominent backdrop to a number of the portraits, the abandoned Parcel Force Building, which is to be demolished to make way for a lengthy redevelopment of the area of Temple Quarter in Bristol. Images from my current project at Bristol Wood Recycling Project. The building stands on the historic site of Bristol’s Cattle Market and when coming into Bristol from Paddington on the train, is the first thing you see. The large block of concrete has a certain Brutalism charm to it. Speaking to many members of the public and Bristol Wood Recycling community, it will be missed. After eight months documenting Bristol Wood Recycling Project's yard and community I had become familiar with the building from the ground, and intrigued by what the abandoned and decaying shell still offered visually. I was invited to visit it with site to photograph the inside with members of the council and contractors. 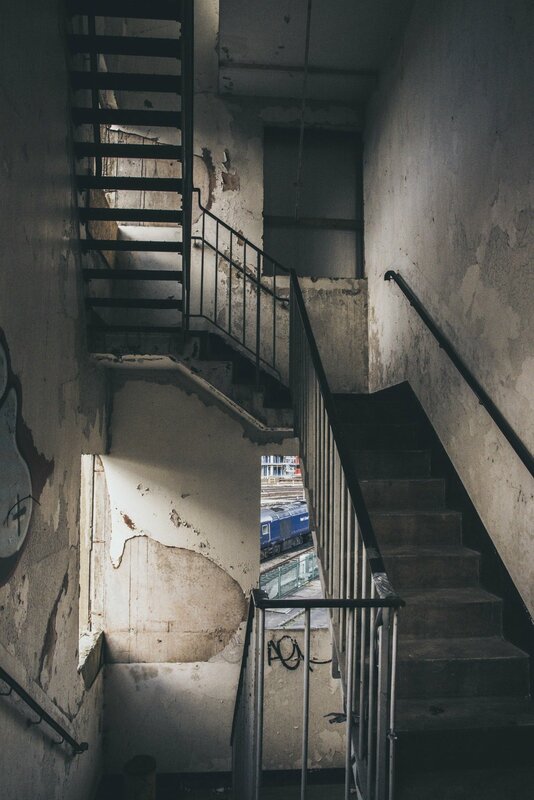 As you can imagine, I was super excited and couldn’t wait to roam around the derelict space with my camera. We walked through the ground floor; the vast space and high ceilings became a prominent feature of the building, much like a grand cathedral, but covered in graffiti and debris. The building had been a sorting office, although very little evidence was left to show this. The structure lay almost bare of any evidence of it’s history, and all I found were some sorting shelves, which would have been used for manual sorting, as the sorting machines could not sort all shapes of parcel efficiently. The derelict building, which stands as a prominent part of the Bristol’s Temple skyline has stood deserted for decades and the decay of such a huge and solid structure was very humbling. Not even a structure such as this can stand the natural elements for ever. The paint that had been there was hardly visible, the roof stained with rain damage and the windows had no glass in them. The light flood in through these huge holes but struggled to light the huge open space. Even though the evidence of decay is obvious in the building you can still imagine the bustle of the busy sorting office and the hum of thousands of parcels going round on conveyer belts. As we walked up the levels we gained amazing views of the surrounding areas of Bristol, and through the windows you caught snippets, buildings like the chimney on Feeder Road or the colourful houses of Totterdown were framed between pillars. From above I got an amazing birds eye view of Bristol Wood Recycling Project land too. I shot their site from the air, showing the scale of the community operation they had run in the space for the past fourteen years. It's a testament to the resilience of the organisation and the commitment of it's community, both volunteers and customers.